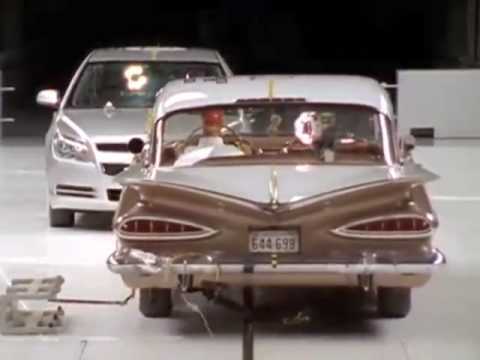 Why were old cars lighter than today's cars? Best Answer: A big reason is safety. Cars today have a much stronger structure so the driver is more protected during crashes. There are also more airbags (they don't weigh a ton, but still). 3. Less luxury features, such as heated seats and sunroofs. 4. Less quality (and therefore lighter) tires. 5. Louder interiors, which meant less sound insulation which reduced weight a bit. A 1970 Dodge Challenger was about twice as heavy as a 1980 Dodge Challenger. The 1980 was much smaller. A 1986 Corolla was lighter than a 2009 Corolla. The 2009 was much bigger than the 1986. Tell us what cars you meant. When you say "old" I'm thinking 1950's and earlier when many cars' bodies were mounted on a steel frame. More modern cars are unit-body design without that heavy frame. My old '62 Nova with a 4 cylinder iron duke engine weighed around 2880 lbs., but it had wind up windows and rubber floor mats, no A/C or any kind of insulation. The most basic of basic transportation. Where is the evidence they were? Old cars were built with steel chassis, iron engines, big diffs, steel wheels and iron brake drums. New cars may be larger but I doubt if they are heavier. They weren't. Modern cars are lighter due to manufacturers' need to increase fuel efficiency. Lighter cars use less gas. Fewer computers and safety regulations dictating structural integrity. In PA, if you get your permit right before you turn 18... do you still have to wait 6 months? Ok please help ASAP. Ok i just made a bet with my boss but no one told me he had an F150 Ford Lightning with a 351 Cleveland kit nd a blower? Learning how to drive, steering and turning is hard.? Why are school bus drivers so mean? most of my bus drivers have been rude as hell? How can I get cheaper rides with lyft ?